I've been baking less overall, and when I've been baking I've been experimenting with gluten free and refined sugar free options, but during the holidays I do prepare a few family favorites. I figure with real butter and my choice of ingredients, I'm still ahead of most of the mass market options. 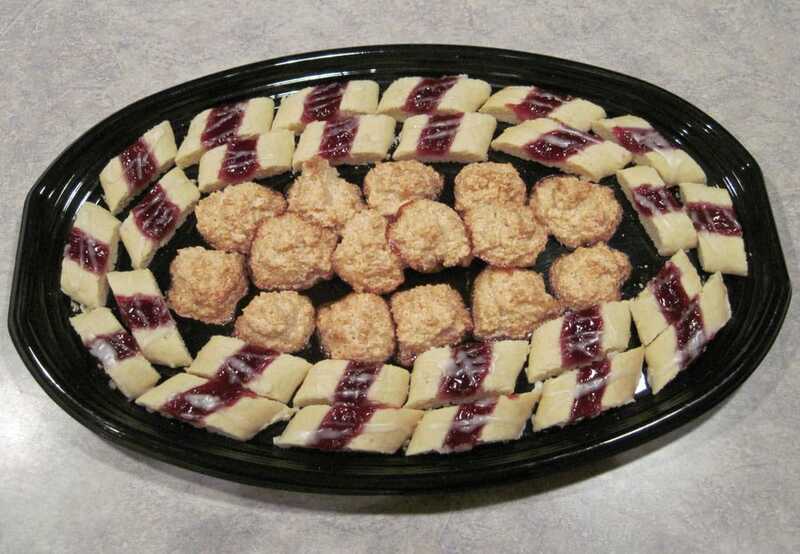 When I make up a cookie tray, I want it to be unique and memorable, with flavors that really “pop”. Each of these three recipes has a distinctive flavor that I think you and your guests will enjoy. In a medium sauce pan combine chocolate pieces and butter. Cook and stir over low heat until melted and smooth. Stir in sweetened condensed milk and vanilla. Stir in flour until well blended. Set aside or place in fridge. 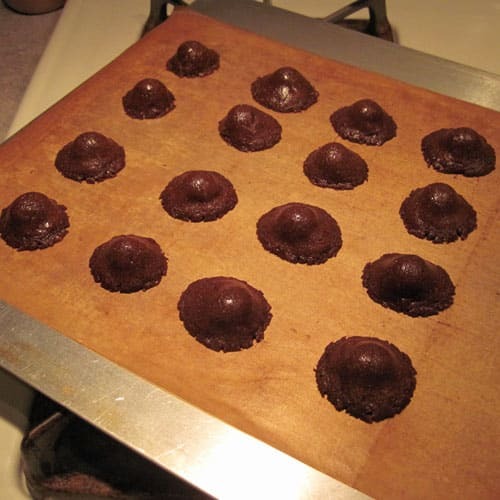 Shape the almond paste into balls containing about 1/2 teaspoon each. I measure one ball, then make the rest based on the size of the first ball. Once you've got the almond paste balls made, wrap each one in about one teaspoon of the chocolate dough. While rolling dough, preheat oven to 350. 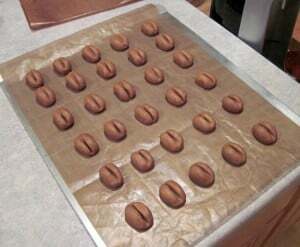 Place cookies on baking sheet lined with parchment paper, leaving about an inch between cookies. As with most of my more delicate cookies, I prefer air bake pans for these. Bake for 6 to 8 minutes, or until chocolate is soft and shiny (do not overbake). If you are using homemade sweetened condensed milk, you may want to bake a single cookie to make sure the dough is firm enough. My first pan turned out very soft, so I had to add more flour to the dough. Transfer cookies to a wire rack. Cool completely. dip in almond glaze and decorate with sprinkles, if desired. In a small bowl, mix together 1 cup powdered sugar, 1/2 teaspoon almond extract, and enough milk (1 to 2 tablespoons) to thin to glaze consistency. 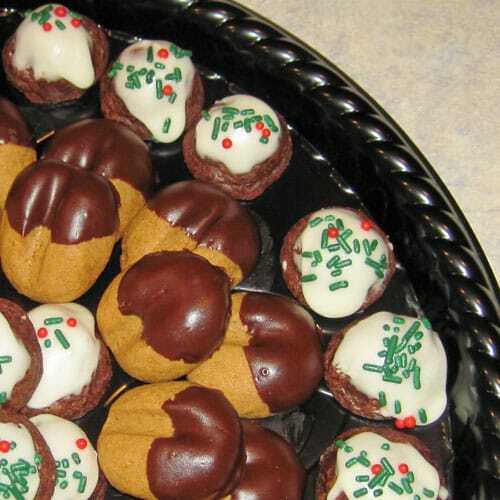 Adapted from Coffee Bean cookie recipe in “Cookies for Christmas“. Combine the coffee crystals and milk. Stir until the coffee crystals dissolve. If your coffee is older and doesn't dissolve easily, warm the milk a bit. Set aside. In a large mixing bowl, mix butter and cream cheese until well blended. Add brown sugar, vanilla, and milk-coffee mixture. Mix until well combined. Add flour and cocoa and stir until blended. Cover and chill for one hour, or until dough is firm and easy to handle. Preheat oven to 350. Shape dough into 1 inch ovals. 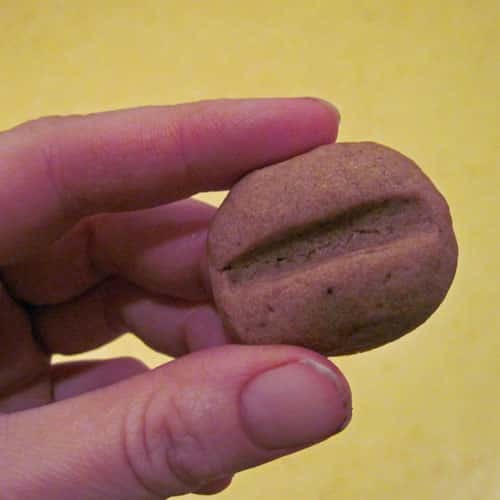 Press a notch in each cookie with a chopstick (or something similar) so that it resembles a coffee bean. Bake for 9 to 11 minutes or until edges are firm and bottoms are a bit darker. Transfer cookies to a wire rack to cool. You can leave these “as is”, but I recommend half dipping them in chocolate. To prep chocolate for dipping, melt chips together with coconut oil in a small saucepan. Dip cookies one at a time until about 1/3 to 1/2 covered, and place on wax paper or freezer paper to set. 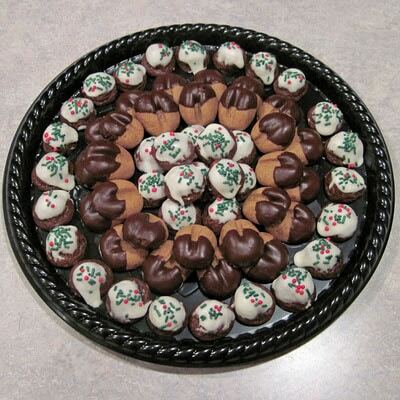 To speed chocolate set, place dipped cookies in a cool area or in the refrigerator. Makes about 48 cookies. In a large bowl, cream together butter and sugar. Blend in egg and vanilla. In a medium bowl, mix together flour, baking powder and salt. Mix dry ingredients slowly into creamed mixture until well blended. Divide dough into four portions; shape each into a 10 inch long by 2 1/2 inch wide log. Place 4 inches apart on well greased or lined with parchment paper. I prefer using air bake pans to avoid excess browning. I spread my dough evenly across a 14 inch wide pan, so it's closer than 4 inches apart. Make a 1/2 in depression down the center of each log. Bake at 350 for 10 minutes, or until soft set (air bake pans may take a bit longer). While cookies are baking, place jelly into a plastic zipper bag with about 1/8″ cut off one corner, or into a pastry bag with a #4 or #5 tip. Remove pan from oven, deepen the depression in each log back to 1/2 inch (the dough rises during baking). You can use a chopstick or measuring spoon for this. This may seem like a fuss, but if you don't do it, the jelly tends to run out, plus you just can't put much in, and the jelly makes the cookie. 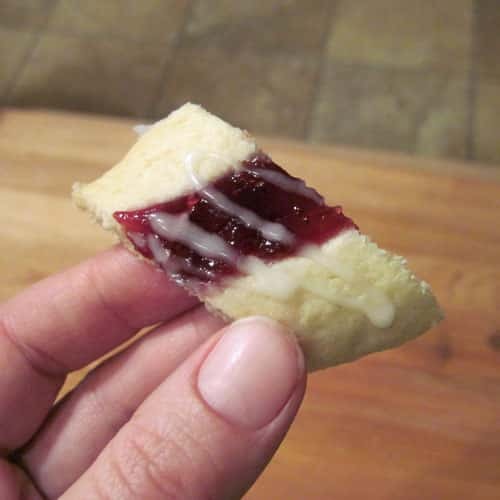 Using the baggie or pastry bag, squirt the jelly into the depression. 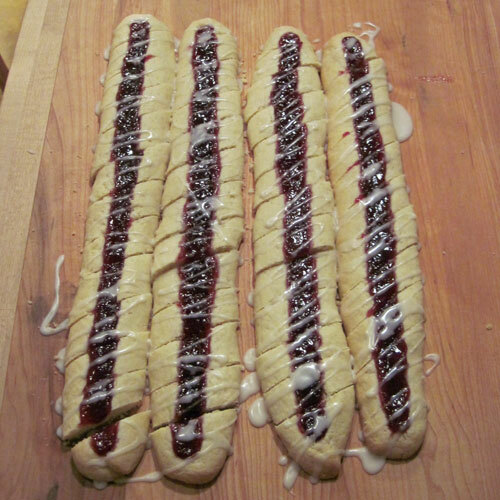 If you've got all four logs baking at once, you can make sure to divide the jelly evenly. Return pan to oven and bake 10-15 minutes longer or until lightly browned. Cool for two minutes. Remove to a cutting board. (If you've used parchment paper, just slide the paper onto the board. It'll make cleanup much easier.) Cut into 3/4 in slices. In a small bowl, combine glaze ingredients until smooth. Drizzle over warm cookies. Cool completely. Yields about five dozen cookies. I paired up the raspberry ribbon cookies on a tray with some coconut macaroons. I don't condone binge eating cookies (in spite of what you might think from the Coconut oil, Bacon Grease, Sugar Cookie diet). I know many folks are going refined sugar free, and that's great, but generally cost prohibitive when you're bringing cookies for a large group. I sent my husband into work with these trays, which were inhaled to the tune of many “oohs” and “ahs”. Oh my goodness those all look delicious. I am especially partial to anything raspberry. And because I have lots of raspberry jam in my pantry, I need to make some of these pretty darn quick. These look yummy!! I had never heard about some of these cookies. I may have to try some. I found you from Turning the Table Thursday. Have a Merry Christmas! Connie – I'll be makign some more raspberry ones soon, too, as the first batch is nearly gone. I hope you enjoy them. frugal mommy – thanks for stopping by. Do you have to use Coconut Oil? Where I live, you can’t find stuff like that; sorry. So, is there substitutions that I can use for some of these hard to find ingredients. You could use vegetable shortening in a pinch. So pretty! At first, I thought the coffee bean cookies looked like little reindeer paw prints … I really thought that was what they were supposed to be! Thanks for making this easy. These raspberry ribbons look pretty, aren’t too sweet and are fairly easy. Just what I’ve been looking for.